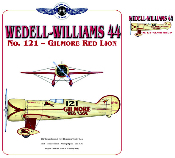 Wedell Williams #121 - classic Air Race aircraft piloted by Roscoe Turner to 3rd place finish at 1932 Thompson Trophy race. Small crest on front, large design on back. One-sided design has large image on front, nothing on the back. Available as a T-shirt or a Sweatshirt. Available in White, Natural and Ash Grey.